Gates, Fence, Handrail, Automation, and More! Atlanta Gate Company has been specializing in automated gates and access control in metro Atlanta and surrounding areas for over 10 years with trusted quality work. 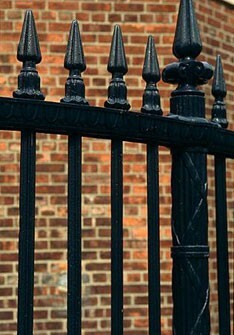 In addition to automatic gates, we also install all types of fence and handrail for the complete safety package. Our custom swing and slide gates are built in house from scratch to fit your needs. With some of the brand names like FAAC, Door King, Linear, Liftmaster, and BFT you are sure to get the best equipment available. We provide one-on-one personal service for all our clients and are here to make security effortless for you as possible, not to stack something else on your plate. It brings us great pleasure to serve our clients and will move mountains to make sure adding security is effective and painless. Thank you for visiting our website. Please fill out the provided form to request information about our products and services or to provide feedback about our site. When you are finished, click the 'Submit' button to send us your message.